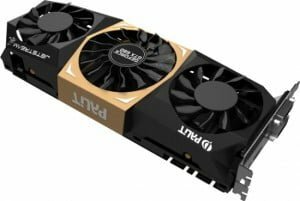 Palit Microsystems Ltd, the leading graphics card manufacturer, announced a brand new double memory size 4GB at Palit GeForce GTX 680 JetStream 風 series. The second JetStream model, Palit GeForce GTX 680 4GB, with massive 4096 MB of GDDR5 memory offers rich realistic and explosive HD gaming performance under maximum resolution setting. Palit GeForce GTX 680 JetStream 4GB brings gamers the cutting-edge performance and an explosive gaming experience to the next new level. The Palit JetStream 風series of graphics cards features innovative cooling and an optimized product design to deliver gamers the ultimate gaming experience. As the latest and most powerful GPU in the series, the Palit GeForce GTX 680 JetStream 4GB guarantees gamers cutting-edge performance and an explosive new gaming experience. Same as the previous Palit GeForce GTX680 JetStream 2GB, Palit continues to gear up with the new Palit JetStream thermal design and the optimized components (DrMOS and 6+2 phase PWM), which makes Palit GeForce GTX 680 JetStream 4GB perform much better than 2GB version by up to 12% at FarCry 2 under NVIDIA Surround setting. Palit GeForce GTX680 JetStream 4GB also offers great OC ability by using Palit brand new utility “ ThunderMaster” which allows you to drag the performance to its maximum score.